Aiden Wright is trying to figure out who he really is, but the truth could cost him his true mate--or his life. Life has always been easy for Aiden Wright. He's smart, athletic, funny, and the ladies adore him. But when tragedy strikes, Aiden discovers the truth about who he really is and his whole world comes crashing down around him. Aiden thought that being a teenage werewolf was going to be awesome, but it might just cost him the one girl who could make him whole. Since her mother's disappearance, Teagan Rhodes's life had been littered with her father's empty beer cans and his hollow promises to change. Convinced that others would only let her down, she keeps everyone at arm's length--but resisting Aiden's charm is proving to be more difficult that she thought. Throw in a psychotic werewolf hunter out to terminate the species and one wrong move, one wrong decision could destroy everything. I think it is awesome when series follow different characters. The Red Ridge Pack series does just that, it lets the reader explore different characters lives. Not only does The Red Ridge Pack series have alternating perspectives in each book, but each book also follows different characters. 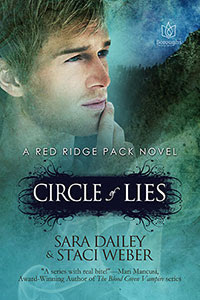 Circle of Lies picks up where Pack of Lies ended. It starts with Aiden waking up in the hospital after saving his little sister, Allison, from kidnappers where he learns some life altering secrets. Once out of the hospital he meets his sisters friend Teagan and falls head over heels for her, but Teagan is not so trusting so Aiden must convince her to take a chance on him. I absolutely loved Aiden's character. I think he is an amazing guy who would do anything for the ones he loves. He isn't afraid to say how he feels and he definitely isn't afraid to stand up for what is right. Although I understand Teagan's initial trepidation towards Aiden I think she really needed to lighten up on him, because he is seriously the best boyfriend. I absolutely agreed with everything he did and was rooting for him through out the entire book. I think his character was formed very well and stayed cohesive through out the story. He never did anything out of character, except fall in love. I was very pleased to read his story, because I really liked his character from the first novel. Teagan's character is mixed for me. Overall I like her, but I don't love her. I understand why she is so standoffish with Aiden, and I would definitely make him prove himself to me too if I was in her shoes, but towards the end of the novel Becca, a girl who wants to be Aiden, is extremely rude to Teagan and makes her second guess her relationship. I understand Teagan getting hurt by what Becca said, but I don't think she should have done what she did to Aiden. I was literally going insane with Aiden. Teagan is just too non-confident for me. I wish she would just stand up for what she believes is true, by which I mean the feelings between her and Aiden, and just be confident about it. For obvious reasons I hated Peters character. I really like that the authors lets the reader get a glimpse into the bad guys life as well so that they can see what is happening before the characters know, but it is so creepy and unnerving. Every time I would get to a chapter told by Peter I just wanted to skip it and get back to Aiden and Teagan's lives. I didn't want to hear about bad things, because I didn't want bad things to happen at all, but at the same time knowing what Peter was planning really did add a bigger adrenaline pumping element to the story, because as the reader you just want to shout to Aiden and tell him what is going to happen. In reference to the story line I think it was nicely done. Both Aiden and Teagan had a lot of issues going on in both of their lives to add to the story besides Peters hand in everything. They both had a lot of personal issues to get through in the novel which really added to the overall story. It wasn't just a love fest or just a tragic story. I think everything balanced. You had times when Aiden and Teagan were being adorable while together, and then turmoil when they were seperate, and then fighting together against Peter's wrath in the end. I also liked the set up of events. As soon as things were going great in Aiden and Teagans chapters it would switch to a Peter chapter where he talked about his awful plans. The novel definitely didn't try to trick you to think everything will be ok in the end. You really don't know how everything will end until you get to that last page. Looking back to the beginning of the novel I wouldn't have guessed exactly correct how Circle of Lies was going to end. I really enjoyed this novel and think it was a great addition to the series. I cannot wait to see what lies ahead. Circle of Lies is a great addition to the series. I absolutely loved that it followed Allison's brother, Aiden. I adore his character and loved reading every minute of his life. I didn't agree with everything that Teagan did, but I understood where she was coming from and forgave her by the end. I love that Staci and Sara have their novels set up to tell alternating perspectives through out the book. It gives the story so much more depth and gives the reader a better overall experience. I think the story line was awesome and definitely had multiple plots to follow from each character having their own personal drama to add to the story. Overall the story was very well told and I think the ending was fantastic. I cannot wait to see what lies ahead in this series and whose perspectives will be told next. Can't wait to read this one! Loved Pack of Lies. Thanks for the awesome review! We are so glad you enjoyed it!